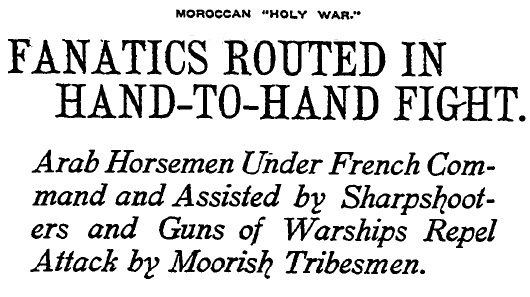 The Times carries a vivid description of a battle between Moorish tribesmen, French sharpshooters and spahis (Arabs in the French service), and though the story is extremely detailed about the fighting, there isn’t a word of background as to the cause. The unrest dates to March 1907, when a mob in Marrakesh killed Dr. Emile Mauchamp, a member of the geodetic survey. Further inquiry shows that there was a general attack on Europeans in which a British official killed two people. 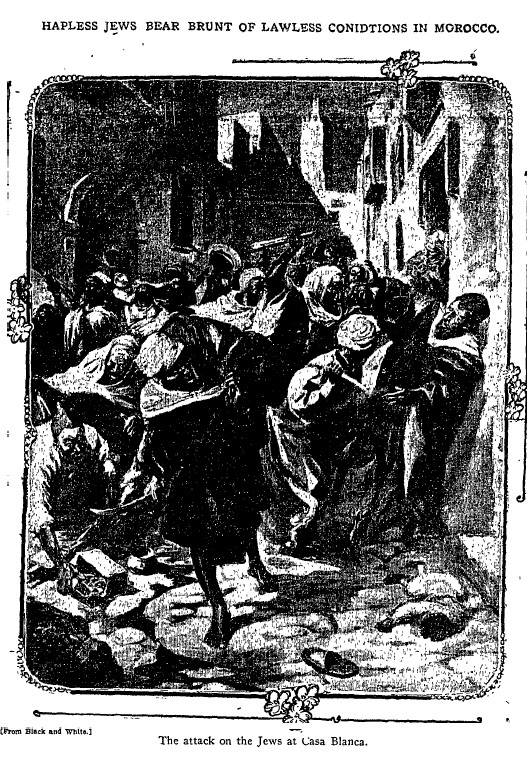 The French officials and newspapers demanded reprisals for the killing of the scientist, and French troops crossed from Algeria into Morocco. The Moors, however, become “more and more insolent,” with the sultan refusing to respect French rights. The French eventually occupied Casablanca. In September, The Times reports: “About 6,000 Moors participated in Monday’s fight. The Moors, who were repulsed on all sides, made a most impressive picture as, garbed fantastically mounted on wild horses and carrying their banners in the front line, they swept down from the hills in splendid formation and charged thunderously to within about 400 yards of the French, who, for a moment, seemed in danger of being overridden. On Sept. 23, 1907, peace is declared in Morocco. For now, anyway. Read more about the Mauchamp affair. The 1911 Encyclopedia Britannica article is here. This entry was posted in 1907, 1908, 1911, Black Dahlia, Books and Authors, LAPD, Streetcars. Bookmark the permalink.